When speaking about sailing yachts, our minds would at once ‘sail away’ towards the renowned shipyards such as Bavaria, Beneteau, Jeanneau, Hanse, Elan etc. However, the Polish Delphia Yachts is becoming a more and more important name on the sailing yachts market. The main goal of their engineers, with Andrzej Skrzat at the helm, is to provide as spacious yacht as possible in the same price range as the competition. The Delphia 37.3 was designed exactly for that purpose, providing three cabins in the 11 m long hull. The hull is quite small, but it has a high level of comfort thanks to several key elements: the high beam which reaches almost to the end of the stern, high sides and a round stylization of the deck above the saloon. The cockpit also appears spacious because it is equipped with a folding table and a steering wheel, while the feeling of comfort is emphasized by teak flooring, a folding ladder at the stern and the independent stern shower. The sailing tasks should be organized in two positions since the jib winches are positioned towards the stern, near the helm, while the stoppers and the remaining winches can be found on both sides of the entrance to the saloon. 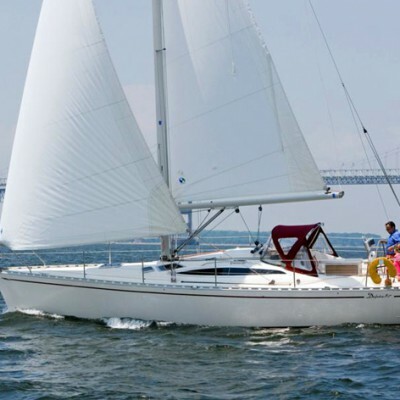 The side decks are wide enough to provide safe communication with the bow, where a large area is provided for sunbathing and spinnaker maintenance. The space below the deck is organized in the ‘classical’ manner. There is one spacious cabin (double bedroom) in the bow and two identical cabins in the stern connected with a large and comfortable saloon. The kitchen is designed with regard to the ergonomic organization so that it is functional in a small space. The saloon seems to be larger than it really is thanks to the large panoramic windows which allow the entrance of daylight into the space. The artificial lighting is provided by a large number of economical LED lights. The toilet and shower are positioned at the opposite side of the kitchen where the ergonomic space organization is emphasized by a contrast between dark and light surfaces. The installation control panel is placed above the chart table while the sofas in the saloon can be used as beds as well. The Delphia 37.3’s standard engine is Volvo D1-30 with 28 horsepower, an S-drive and two-wing propeller, combined with a ballast rudder. Rigging is organized by 9/10 formula with a 1850 kg keel which provides a rather conservative sailing experience compared to faster models of the same category offered by the competition.